[136 Pages Report] The Disaster Recovery as a Service (DRaaS) market size was USD 1.72 Billion in 2016, which is projected to reach USD 12.54 Billion by 2022, at a Compound Annual Growth Rate (CAGR) of 41.8% during the forecast period (2017–2022). DRaaS enables replication of data and application to ensure business continuity in the event of a disaster. With an increasing adoption rate of cloud-based solutions among Small and Medium-sized Enterprises (SMEs), the Disaster Recovery as a Service market is expected to grow rapidly. The base year considered for this study is 2016 and the forecast period considered is 2017–2022. The Disaster Recovery as a Service market ecosystem comprises major DRaaS providers, such as Amazon Web Services (Washington, US), Cable & Wireless Communications Limited (London, UK), IBM Corporation (Armonk, New York, US), SunGard Availability Services (Pennsylvania, US), TierPoint, LLC (Missouri, US), and VMware Inc. (California, US). Other stakeholders of the DRaaS market include systems integrators, application designers and development service providers, and network service providers. The Disaster Recovery as a Service (DRaaS) market size is expected to grow from USD 2.19 Billion in 2017 to USD 12.54 Billion by 2022, at a Compound Annual Growth Rate (CAGR) of 41.8% during the forecast period. The demand for DRaaS is majorly driven by increased flexibility and automation capabilities. With an increase in the adoption rate of cloud-based solutions among Small and Medium-sized Enterprises (SMEs), the Disaster Recovery as a Service market is expected to grow rapidly. The cloud backup market has been segmented on the basis of service types, service providers, deployment models, organization size, verticals, and regions. The backup and recovery service segment is expected to have the largest market share and would dominate the service type of the DRaaS market from 2017 to 2022, as the segment provides cost-effective, automated, reliable, secure, and scalable solutions to enterprises and ensures business continuity in the event of a disaster. The professional services segment is expected to play a major role and would grow at the highest CAGR during the forecast period, as these services provide enterprises with training, education, and consulting, support and maintenance services depending upon business requirements. The public cloud deployment model is estimated to hold the largest market share in 2017. By using on-cloud DR services, enterprises are developing new and better ways to enhance operational benefits, while reducing costs. Lower costs and greater efficiency than traditional DRaaS software are driving the demand for DR services on cloud. The enterprises, which are implementing DRaaS, are increasingly inclined toward deploying cloud-based services to store and manage their business-critical data. DRaaS is increasingly adopted by companies in various verticals, such as media & entertainment, government & public sector, and others, which have led to the growth of the market across the globe. The media and entertainment vertical is expected to grow at the highest rate from 2017 to 2022 in the Disaster Recovery as a Service market, whereas the Banking, Financial services, and Insurance (BFSI) vertical is estimated to dominate the market with the largest share in 2017. 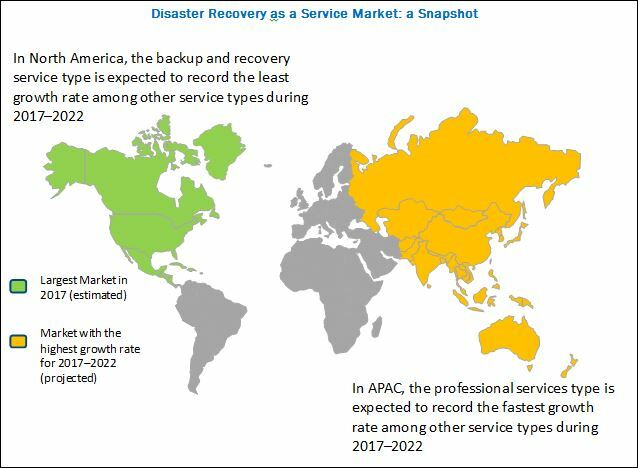 North America is estimated to have the largest market share in 2017, whereas the Asia-Pacific (APAC) region is projected to grow at the highest CAGR during the forecast period in the Disaster Recovery as a Service market. An increasing need for data management services and shifting of workload to the cloud environment are driving the demand for DR services globally. Adoption of DR services are increasing in the market, owing to the growing awareness about cloud-based backup and recovery benefits among enterprises and lowering the operational overheads. However, issue of inadequate site separation between primary and backup site and compatibility concern of certain applications in the cloud environment may restrain the growth of DRaaS market. Some of the major challenges in the DRaaS market are difficulty in achieving security and compliance, and high network bandwidth requirements. Major vendors in the Disaster Recovery as a Service market include Amazon Web Services (Washington, US), Cable & Wireless Communications Limited (London, UK), IBM Corporation (Armonk, New York, US), SunGard Availability Services (Pennsylvania, US), Microsoft Corporation (Washington, US), iland Internet Solutions (Texas, US), Infrascale, Inc. (California, US), Bluelock, LLC (Indiana, US), Recovery Point Systems (Maryland, US), Acronis International GmbH (Massachusetts, US), TierPoint, LLC (Missouri, US), and Geminare Incorporated (California, US). These players have adopted various strategies, such as new product launches, partnerships, agreements, collaborations, mergers & acquisitions, and business expansions, to cater to the needs in the DRaaS market.